Traditionally separated from the main house, a classic conservatory or sun room remains a popular add-on, particularly to a period property. However, a more sophisticated approach, in the form of a flexible, fully integrated open-plan space, is becoming more popular, as it can accommodate a variety of key room types, including the kitchen, living room or dining area. Whether you opt for a conservatory that is in-keeping or minimalist, ensure it works in harmony with both your home’s exterior and the adjoining rooms. Need more advice? Find out about extending a house in our ultimate guide or head to our dedicated garden hub page. How much does a conservatory or sunroom cost? A bespoke timber or aluminium conservatory or sunroom costs in the region of £30,000 to £50,000. Expect to pay from £40,000 for an oak frame design. A better quality bolt-on conservatory kit costs in the region of £10,000 to £20,000. Cheap PVCu DIY kits start from as little as £2,000 to £3,000, but often detract from the appeal and value of a period home in particular. Is a conservatory or sunroom right for your home? A conservatory is traditionally an all-glazed structure and was popular for homes from the Victorian era, when ornate structures were fashioned from glass, wrought iron and wood. Bay fronted styles, high gabled roofs, elaborate finials, cresting, and ridges may be in evidence, along with stained glass, gothic motifs and intricate tracery. The wealth of design features, along with a diversity in shape and dimension make this type of structure so easily adapted to suit a variety of period homes, whatever its style and size. For a greater link with the house, opt for a sunroom, which tends to be a more solid addition with a full roof, lots of glazing and patio doors. Oak frame extensions are particularly sought after and can significantly increase a home’s value. Check out more ways to add space and value to your home. Do you need planning permission for a conservatory or sunroom? In many cases, the addition of a conservatory or sunroom falls within permitted development rights, meaning you don’t need to apply for planning permission. The same limits apply as with extensions, affecting factors such as size and height – see planningportal.co.uk for the rules. Local authorities can remove some permitted development rights with Article 4 directions, and if your home is located within a designated area, such as a Conservation Area, extra restrictions apply, so check first. If your home is listed, you will need to apply for listed building consent. Which conservatory frame material to choose? By far the most commonly used material for conservatories, PVCu is more affordable than the alternatives, widely available and maintenance free. However, it is not the best choice to complement a period home as the material results in bulkier, inauthentic sections and details. Traditional glass houses had metal frames, and today aluminium is a popular choice for its classic looks and slim sightlines. It can also be used to cast more ornate designs, similar to the conservatories of the Georgian and Victorian eras. Timber frame is the alternative desirable option for a period home. Oak sunrooms look stunning and if unpainted the wood will weather beautifully. Other popular timbers include Douglas fir, sapele and Accoya, which is modified to be incredibly durable and resistant to fungal attacks. For the best of both worlds, some manufacturers offer composite conservatory frames, which have an aluminium exterior, great for low maintenance, and a timber interior, for warmth. Glazed extensions to older homes must be sympathetic to the house’s period and architecture, meaning a bespoke design is always going to be the preferred option. A bolt-on model is unlikely to add to the house’s appeal or value, and on listed homes will be unacceptable. Edwardian, Victorian and Georgian homes all have different proportions so there is not a one size fits all rule; use the existing house as a template for the design. The design must be in proportion with the existing property and pay close attention to details, such as the roof pitch, bargeboards, finials, windows and colours. Where possible source similar materials such as timber, brickwork, flint facings and rendering. On smaller terraced houses and cottages, a lean-to design often works best. Authentic-looking period design can be difficult to recreate, so local authorities increasingly support unobtrusive, minimalist glazed additions to old homes. If your conservatory is open to the main house, you will need to blend it in with the rest of the interior using similar colour schemes and furniture styles. Does your conservatory's orientation matter? In order to capture as much sunlight as possible, a glazed room should be south, south-east or south-west facing. If you plan to use the space most first thing in the morning for breakfast, or as an evening room, however, then it will work best if it faces east or west accordingly. 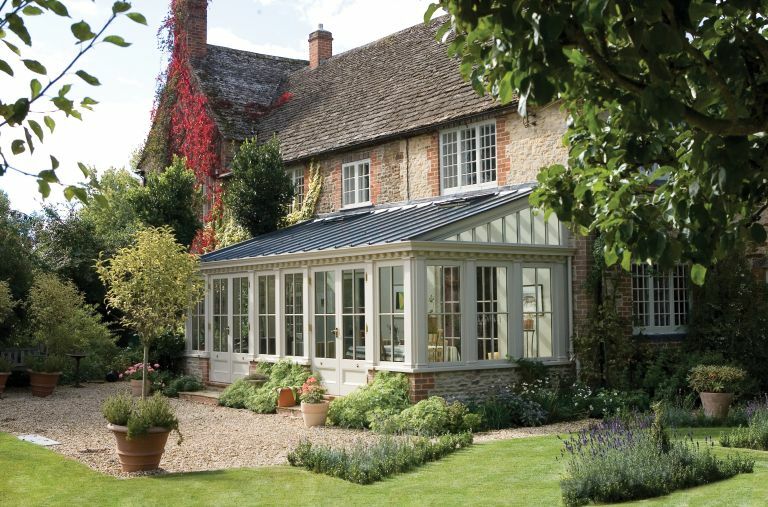 While south-facing conservatories will capture the most natural light, to prevent overheating they also require adequate shielding from the sun, with temperature control measures to stay cool. Other types of glass have coatings to reduce the sun’s rays, such as Roof maker, which also retains heat in winter. Pilkington has several options, including Cervoglass, an insulated glazing product that protects against both temperature extremes. With so much glazing, security could be an issue, but glass in conservatories must be toughened up to a height of 800mm, or up to 1,500mm for glass doors. Any quality glass roof should also feature toughened glass as standard. Do you need conservatory blinds? Clever glazing isn’t always enough to keep a room with so much glass at optimum temperature in extremes of weather. Conservatory blinds are very useful for blocking out strong sun, and can be fitted on just the roof, or on both roof and doors. Opt for bespoke designs that fit your conservatory perfectly and are as discreet as possible when not in use. Pinoleum blinds, which have a wood-weave design, are an attractive option and create a dappled effect with the light. Electronic operation will make life easier. Made from thin strips of wood woven together, traditional pinoleum blinds filter the sun’s glare, rather than block it, creating a soft dappled light. Ventilation and heating are essential to make a conservatory, orangery or sunroom feel comfortable. Ventilation is usually through roof vents, which can be operated electronically or manually with a pole. The vents can be thermostatically controlled and can also include rain sensors. Other solutions are mechanical fans mounted within the roof pinnacle, passive trickle vents within the roof ridge or opening windows within the vertical side frames of a roof lantern. For heating the space in colder months, underfloor heating is usually the best option as it’s the least obtrusive. Underfloor heating can be warm water as part of a larger ground-floor system or, for instant response, electric. A stone or tiled floor is most thermally conductive. Trench heating, a warm-water system sunk into the ground with a grille on top and running around the perimeter of the room, can make an attractive feature. A wood-burning stove can be a stylish focal point in a glazed extension. Perhaps the main attraction of a conservatory is the connection it creates with the garden. Most period-style additions will open out to the garden through French doors, but bi-fold doors are increasingly popular as they stack to the side to allow for a wider opening. Find out more about choosing bi-fold and sliding doors. Does a conservatory need building regulations approval? A conservatory is part of the existing home or building if it is open plan to the rest of the house, and will have to comply with full building regulations, particularly with regard to glazing and heat loss. A separate conservatory that has exterior-quality doors separating it from the main part of the house may not need to apply, as long as it is less than 30m2 and it meets the safety regulations for the glazing and electrical installation. A good designer can advise and liaise with conservation and planning officers to ensure the new structure makes the best use of the available space within the parameters of legislation. Look for a company who have the reputation and years of experience in designing for period properties. Be guided by their recommendations and where possible visit their workshops and design studios to see first hand the quality of the conservatories and this will help you understand what detail is being proposed. Try to invest in the best quality you can afford as bespoke conservatories will be individually tailored to your needs and add value to your property.